People either hate me or love me. I wish they would decide and stop being so fickle. People are so fickle. I can’t help being what I am. Well, maybe that isn’t totally true. Perhaps I am paying for some long-forgotten sin or just ‘doing time’ while I wait for the cycle. But, don’t think I haven’t entertained the idea, dare I say it, that I am actually being rewarded in this heaven for a good deed that no person on earth can recall? People look at me and see a simple mail slot. But, I am much more than that. I can be a savior and allow a person’s day to be the happiest they’ve had in a year…or a decade. Or, I can be bearer of the bleakest news. As the savior, through me can pass the post card from a foreign land, a note from the girl (or guy) down the hall asking a favor…or a date, a tax return to help with the rent, an invitation to a party or a letter declaring everlasting love and forgiveness to the one who sits in a tatty chair and watches and waits for a signal from me that something is about to drop to the floor. As the gate-keeper for sadder stuff, I can let slide a sympathy card, a Dear John letter, a post card from a missing child that says they will never come home again…”thanks, but no, I’m happy here in Mexico”, a notice of overdue rent, a summons, a shabby piece of junk mail, a phone bill, an electric bill or the newspaper that carries the obituary of one’s childhood sweetheart. People fail to realize that I can see two worlds at once. On one side, I see the indifference of the letter-carriers as they amble down the hallway. They might glance at the return address; holding up the hallway light, but only to smile, frown or simply shuffle through their fist-full of mail. Looking inward, I can see the loneliness, grief, misery, the bottle and the gun on the table, and the chin of an unshaven man or the mascara stained cheeks of a bottle-blonde who put on too much lipstick on a Saturday night …again. I may even be witness to a happy couple, she in a polka-dot dress and he in a stained white undershirt, playing a game of canasta on the kitchen table, two bottles of long-neck Pabst Blue Ribbon at their elbows. I am also the revealer of dark secrets…as seen when a pencil pushes my lid up and a pair of wet panic stricken eyes peer through me to witness acts of betrayal and lust. But always in the background is the faded gardenia wallpaper, a dresser with a yellowed doily and a vase of plastic flowers. In the outside world of the hallway, a fresh coat of tan paint is added every year. 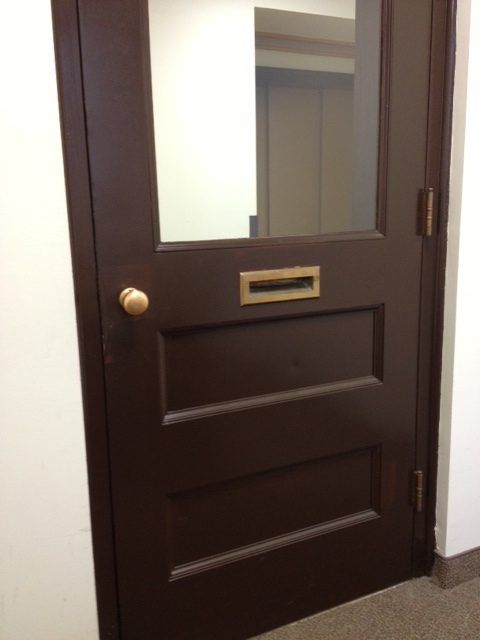 My door is slathered with a chocolate brown high gloss enamel. Someone, though, takes the time to apply gobs of Brasso to me and makes me shine, for awhile. This inside room changes little over the year. Same set, different cast. So, what about my fate? In another time I may have been fashioned into a knocker on a stately manor house, the brass knob of a bordello in Memphis, a germ-covered handle on a schoolroom full of frightened and sickly children. This building will eventually fall or get razed and I’ll be recycled into something else entirely. A key maybe, or a tap-dancing cleat, or a hub nut on a New York City taxi. One way or another I will exist indefinitely…unlike those whose lives play out on either side of me. I just wish people would decide if they love me or hate me. I’m just not used to swinging both ways.